Last month, eight women from the Seattle area set out on the journey of a lifetime: A 750-mile adventure race to Alaska on a sailboat with no motor. With limited experience and some novice sailors, they never imagined they would win it all. Two of the most inconvenient things that can happen in a boat race are for the wind to die and for the current to turn against you. So of course both happened simultaneously last month, on Day 3 of the Race to Alaska, as Sail Like a Girl, an all-women’s team from the Seattle area, was sailing through Johnstone Strait, a channel sandwiched between Vancouver Island and mainland British Columbia. At that point in the adventure race, Sail Like a Girl was jostling for the lead with two boats. But as the wind died and current worsened, the team noticed the other boats had stopped, tucking themselves behind islands to wait it out. The Race to Alaska prohibits the use of motors, so, the teams on other boats figured, how much progress could anyone make with the current and wind working this much against them? But the women on Sail Like a Girl kept going. They decided to find out. The team sailed along the shore, feverishly pedaling the pair of bikes hanging off the stern for extra propulsion. It took them three hours to go one mile. But they continued inching forward, and because they did, they were the first to get the new wind. 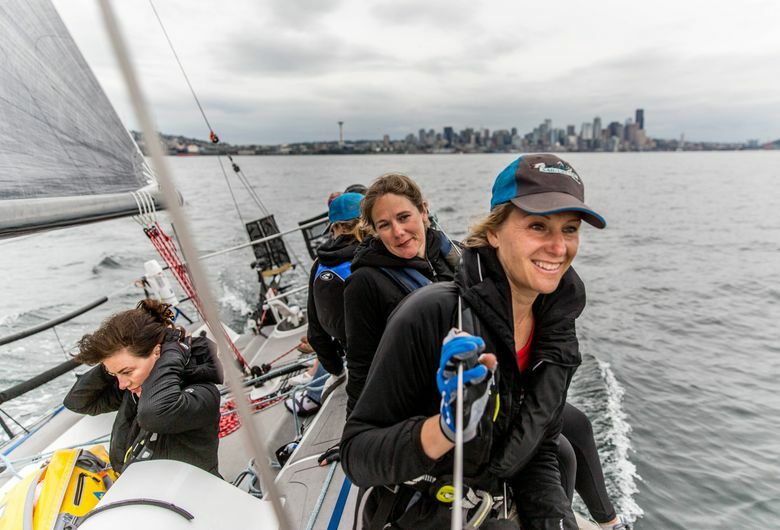 That sort of determination helped the women conquer the elements and surpass the competition to become the first all-female crew and first monohull to win the grueling 750-mile adventure race from Port Townsend to Ketchikan. There were some close calls, tears of fear and moments of uncertainty. But in the end, it was all worth it. This is how the adventure of a lifetime unfolded, through the eyes of the women who won it all. The premise of the Race to Alaska is simple: Get from Port Townsend to Ketchikan completely self-supported and without a motor. The mode of transport? That’s up to you. An official route? None, besides a requirement to sail through Seymour Narrows and Bella Bella, British Columbia. The first-place prize is $10,000 in cash nailed to a block of wood. The runner up gets a set of steak knives. Teams must complete the first leg of the race, from Port Townsend to Victoria, British Columbia, to move on to the main sector. Of the 30 teams that set off from Victoria for the 710-mile main leg of the race, only 21 actually finished. The final team to complete the race arrived in Ketchikan on July 9, just over three weeks after the race’s start. 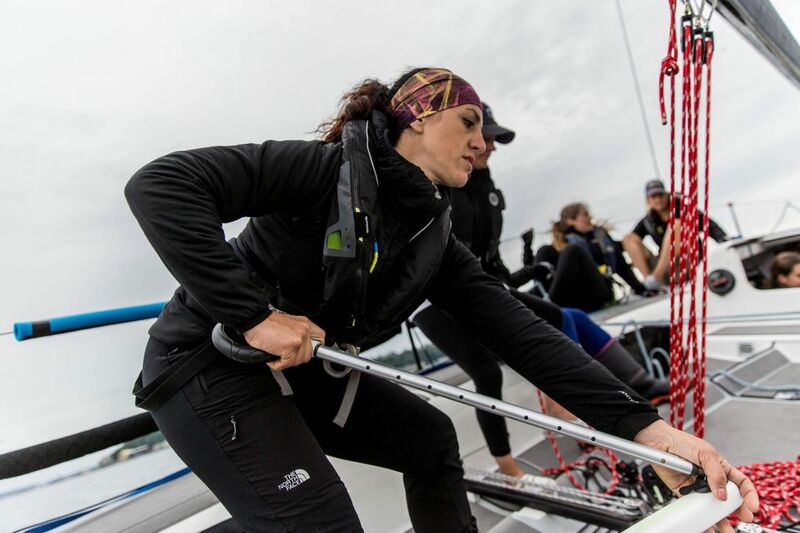 Anna Stevens, a 41-year-old marine logistics director from Seattle, first approached Goussev in October with the idea of competing in the race. They decided to assemble an all-female crew to encourage more women to take up sailing – a sport they say is male-dominated – and to push back against stereotypes about female sailors. When they filled out the roster, Goussev, 41, was the common denominator. She knew Stevens, Morgana Buell, and Kate Hearsey McKay from the local sailing circuit, and Kelly Danielson, Aimee Fulwell and Allison Ekberg Dvaladze as fellow Bainbridge Islanders. She met Haley Lhamon at a boat show in January, and Lhamon was the last one to sign on in May. The women did not all know each other beforehand, and of the eight, Danielson, Fulwell and Ekberg Dvaladze had never sailed or were fairly inexperienced. Next on the to-do list: Get a boat, and learn to sail it. Goussev bought their vessel, a Melges 32, second-hand in January. None of the women had experience with that kind of boat, a 32-foot-long racing vessel that’s known for its speed and maneuverability. It was in need of serious maintenance and required hundreds of hours of refurbishment. The women enlisted their families to help. They also had to build it to go farther offshore. At the onset, Sail Like a Girl wasn’t dead-set on winning the Race to Alaska, but wanted to do the whole thing without stopping. “Our goal was to look back, reflect, and say, ‘We sailed this boat the best we could, it was a well-sailed boat, and we tried really hard and it paid off,’ ” Hearsey McKay said. At noon on Sunday, June 17, the Race to Alaska participants — a mix of monohulls, catamarans, trimarans, and kayakers — set off from Victoria’s Inner Harbor and effectively said goodbye to civilization. On the water, particularly the treacherous Inside Passage, there are no day jobs to worry about, no kids to take care of, and you’re lucky if you get any cell service. 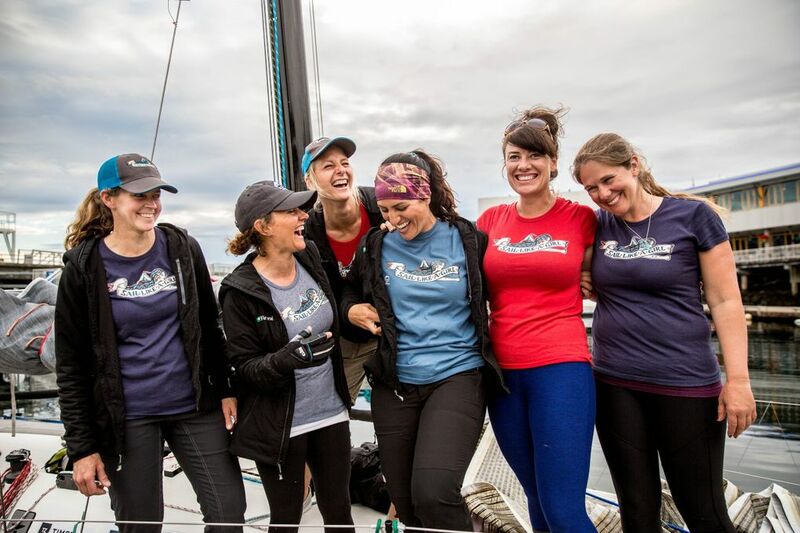 The women of Sail Like a Girl did little more than those four things on repeat until they arrived in Ketchikan on June 24 at 12:17 a.m., six days, 13 hours, and 17 minutes after they set out from Victoria. Goussev estimates the crew packed more than a ton of goods, equipment, and other supplies — including 400 pounds of water — onto their 3,700-pound boat in preparation for the voyage. That added weight is not ideal for racing a boat, but was necessary. Much of that added weight was food for the journey (though, in retrospect, they think they over-provisioned). They packed dehydrated meals and had a jet boiler to make hot food, but they mostly ate snacks: candy, peanut-butter pretzels, gummy bears, vegetables, hummus and pita, and salami and cheese sticks. Sleep was hard to come by. Though each woman was allotted six hours a day, about three hours at a time, they all generally slept much less than that. It was normal for them to be too excited or worried to sleep. The women worked on three-hour rotations: three hours on duty, three hours off, and a three-hour flex period where they could catch up on sleep, clean the boat or eat. Aside from helping sail, they took turns pedaling the bikes attached to the back of the boat to provide propulsion when there was little wind. The women estimate they biked about 50 percent of the time, and that on the last day alone, they biked 15 hours straight. Early Friday morning, the women had just passed through Bella Bella and were taking an inside channel hoping for some breeze. They were in first place but had other boats on their tail, and they were starting to feel the pressure of the race. The boat went from six knots to a dead stop. The log was pinned against the keel and hanging off the stern of the boat. The women couldn’t tell right away how much damage the boat had sustained. But they weren’t optimistic. Immediately, they started thinking through evacuation scenarios. Eventually, they managed to sail off the log. They took the headsail down and went as slowly as possible until daylight, when they checked the boat for damage. Fortunately, when they hoisted the sails back up and picked up speed, the boat sailed perfectly. “She’s a really tough boat,” Stevens said. The women didn’t have cell signal to check the race tracker, but because they’d slowed for so long, they figured they’d lost the lead. The thought was demoralizing, but all they could do was push hard to see if they could catch up. About 24 hours after hitting the log, the team regained cell service. Stevens received a text from her son with a timestamp of 1:12 a.m. It said they were in the lead. Incredulous, they got the race tracker up. There it was. First place: First Federal Sail Like a Girl. They didn’t believe it. Stevens hit refresh. The rankings stood. Six and a half days after leaving Victoria, Sail Like a Girl approached Ketchikan in the lead. There were so many lights on shore and from outgoing fishing boats that the women had trouble seeing and almost sailed past the finish line. But when they heard the crowd on the dock start to cheer, they knew they’d made it. The women took the sails down, got on the bikes and pedaled in. Their legs were weak from not having walked on land for almost a week, but, with their arms around each other, they all managed to step off the boat and onto the dock at the same time. They went up to the bell at the finish line and rang it together. Looking back, they say that while it was rewarding to win, it was just as fulfilling to see what the act of plunging into the unknown had brought out in themselves. “We found the warrior inside of us that we know lives in there,” Goussev said. “We know that we’re strong women, but when you’re running your daily life, you don’t always get to meet her. From the beginning, the women faced skepticism and concern from others because they’d started preparations for the race relatively late and their crew included three novice sailors. It was seen as a risky decision for a journey through treacherous waters in such a high-speed boat. But the women think the unique makeup of their team was one of their biggest strengths. Goussev and Lhamon were the main drivers, Hearsey McKay was a master trimmer and ran the headsails, and Buell – who was able to only sail the first leg – did foredeck work, which includes taking down and putting up the correct sails. Goussev refers to Stevens as “MacGyver,” because she could fix any problem that arose and help anywhere on the boat. The newer sailors pulled their weight, too. Ekberg Dvaladze and Danielson, the triathlete, performed like veterans and were the go-to bikers. Ekberg Dvaladze helped with driving and Danielson became the team’s caretaker. Fulwell ran the foredeck flawlessly despite having learned to sail only in March. And with such a variety of strengths, they could attack issues from all different angles. “We would not have succeeded without any one of these women,” Goussev said. But beyond their personal goals and a desire to make their families and communities proud, the women were powered by a belief that the race was about something bigger than themselves. They wanted to honor their “warriors” – their loved ones who have been affected by breast cancer. The team wrote the names of their warriors on the boat’s mast before setting sail. “Whenever I felt a moment of weakness or exhaustion, I’d just go down and look at those names and think, ‘This is nothing in comparison to what these women are battling,’ ” Goussev said. 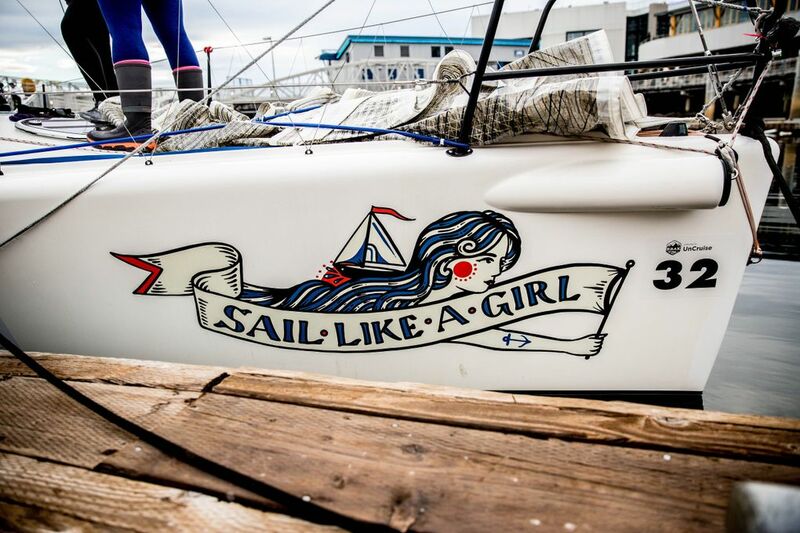 Accordingly, after accounting for boat expenses, Sail Like a Girl will donate its Race to Alaska prize money to the Pink Boat Regatta, a local race that raises money for the Breast Cancer Research Foundation. The team will also race in that regatta in September. So after that, what’s next? They’ve floated the idea of doing Race to Alaska again, but in a different way. They could take their time and enjoy the scenery of the route, something that they had to forgo this year. But they also want to see what their boat can do as a racing vessel, weaving through buoys minus the 2,000 pounds of added weight in supplies needed for their Alaska adventure. After all, the journey has always been about much more than just this one race. Editor’s note: This story has been updated to clarify that the two boats jostling for the lead with Sail Like a Girl at Johnstone Strait stopped, but did not anchor, and the wind conditions worsened when the wind died.